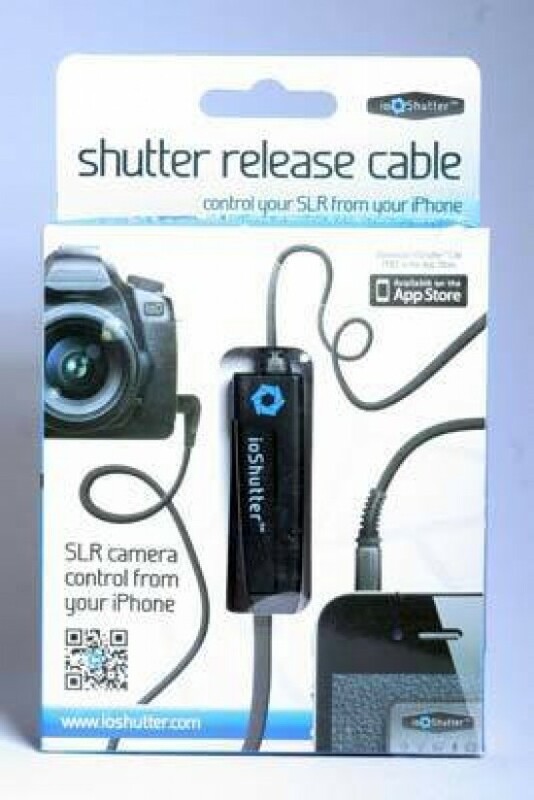 The ioShutter from Enlight Photo is a DSLR accessory that allows you to remote trigger your DSLR using your iPhone or iPod Touch or iPad using an app downloaded from iTunes and the camera's remote trigger port. In this test, we'll see if it's any good and whether it could make manufacturer remote triggers redundant. The ioShutter retails for £59.95 / $69.95. 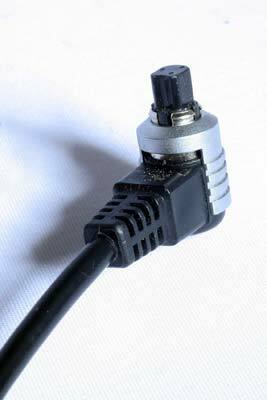 In the old days, when film cameras ruled the Earth, a remote trigger was a piece of piping with a metal rod through it that you pushed down. It screwed into the shutter release button and they could be picked up for about a fiver in today's money. These days, it's not so simple. If you have a Canon EOS 5D MkII, for example, the TC-80N3 costs over £100. 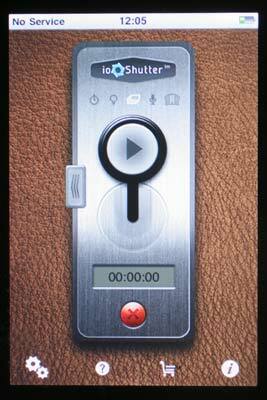 It offers extended features not normally found on a regular release such as self, interval and long-exposure timers. 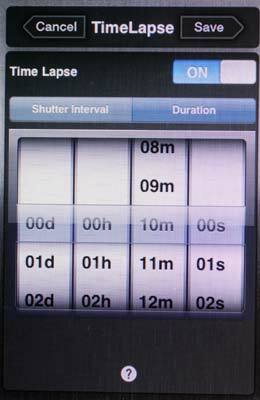 Similarly, the ioShutter (we tested the Canon N3 version) has a timer and long-exposure options as well as time-lapse, ClapToSnap and ShakeToTake. The item you get in the box is a simple cord with a 3.5mm jack plug on one end and the remote trigger plug on the other. To use the remoter trigger, you have to download the free app from iTunes There's another version that costs £6.99 which we'll cover later in the review. Once the app is installed on your Apple device, plug the 3.5mm jack plug into the earphone socket. Now here's the interesting thing: the trigger won't work if the volume is turned down on the trigger device (we'll assume you're using an iPhone). 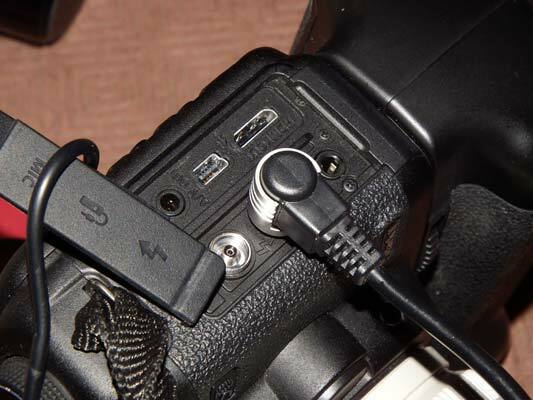 Plug the opposite end of the cable into the remote socket of the camera (generally found on the side) and as long as it's in properly, it's plug and play and will work immediately. Tap on the app on your phone and the program launches. The screen has a faux leather effect background – much the same as a DSLR – and in the centre is a rectangular panel where you work from. There are five icons across the top and each one will light up as you use a different feature. The large round circle is your shutter release. 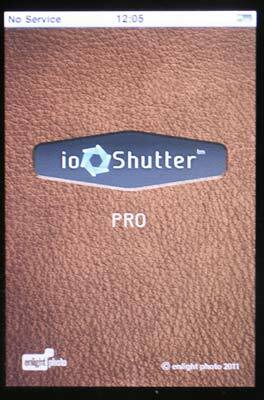 You can tap it to take a picture or you can hold it down for the light meter before releasing it to take a picture. The shutter circle can be moved up and down. Half way down, it will sustain the shutter on the camera. Drag it all the way down to lock the shutter open move it back up to finish the recording. This has the same end results as twisting the dial on a cable release on film cameras. 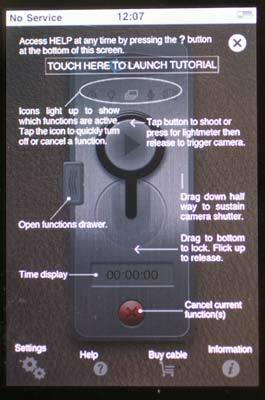 The timer will show you how long the camera has been exposing for, which is a useful feature for very long exposures. There's also a red “x” at the bottom to cancel an exposure you have going. Tap the small button on the left of the main panel and a small drawer opens which offers different modes for you to play with. 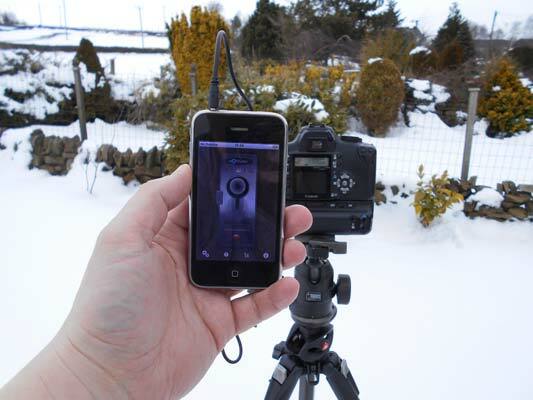 The five you have available are Timer, Bulb, Time-lapse, Sound (Clap to Snap) and Shake (Shake to Take). The Timer has two options: 20 or 60 seconds and the Bulb has three: 60, 90 or 120 seconds. The next three will open up after you've been given the choice of subscribing to ioShutter. It's optional and you can press the “No Thanks” key which will still open the features. There are three options in the Time-lapse menu. You can expose every five seconds for five minutes, every 5 seconds for 10 minutes or every 30 seconds for 10 minutes. ClapToSnap and ShakeToTake both have to be switched on before they'll work. You can upgrade these modes to the Pro version in iTunes. The cost is around £7 which isn't all that much and coupled with the unit, still costs a lot less than the comparable Canon product. It just seems a shame that Enlight say it's one price and that the App is free, but then you have to pay money to get the full functionality. It seems that the features they give you are there to test the product and make you want to buy the extra.